This Saturday, June 25, will see the Ireland National Team play a challenge match against players from the rest of the League. In other news, local side Leeside took on a team from the HMAS ANZAC. Also previewed are the upcoming ARFLI finals. The National side's warm-up should be a very competitive match and a good test for the Irish boys, as the rest of the League team will be bolstered by a strong contingent of Australian players playing in the League and topped up by players that were on the periphery for the National Team. Also last weekend the Leeside Lions played a challenge match against HMAS ANZAC. The HMAS ANZAC Slayers football team recently played a game against the Hamburg Dockers. The ANZAC Slayers won 6.15.51 to 4.6.30 against Hamburg but were not so fortunate to run into a Pride of Lions. The Lions ran out convincing winners 24.17 (161) vs. 1.6 (12). In local news from the Australian Rules Football League of Ireland ((ARFLI), the scene is set for an interesting and open finals race this year. The semi-finals will be held on 2nd July 2005. The Leeside Lions, Dublin Eagles, and Dublin Demons all finished the home and away fixtures with 4 wins and 1 loss. The Lions took the preliminary honour of Minor Premiers finishing with 156.91%, less than 0.5% ahead of the Eagles on 156.58%. The Crows slipped into the last remaining spot for the finals with 2 wins for the season. Congratulations to the Tigers and the Saints this year who, although did not register too many premiership points, were super competitive in most of their matches. They can take a lot out of this season and look forward to building on their recent efforts and give the finals a real nudge next year. The Premiership this year has seen some incredibly close encounters and out of the four sides competing the finals it is anyone’s guess who will win the title in 2005. In the first semi final the Clare Crows head down to Cork to battle against the Leeside Lions. These teams faced off three weeks ago in a tough encounter, resulting in the Lions running over the Crows by 19 points. Both have had strong seasons but the Lions hold a hoodoo over the Crows down there in Cork and the Crows will have to be at their absolute height of powers to break the curse of their Munster rivals. The Lions are unbeaten by the Crows at home and hold an impressive record of winning home matches. 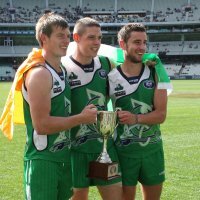 The traditional rivals of Dublin Australian Football – the Eagles and Demons, square-off in a local derby. These two teams have been super competitive against each other over the past three seasons and come semi final day 2005 things won't have changed. In their only Premiership fixture this year it was the Dublin Demons who came out on top by 23 points. But the Eagles form of late signals that this match will be a close encounter.